Today I'm profiling one of NZ's leading Pakistani Irish republicans. After living in the UK, Aziz Choudhry has been active in Christchurch since at least the early '90s. 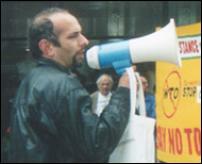 In 1992 Choudhry was active in the Canterbury University Treaty Action Group and a presenter of CORSO's "Sounds Subversive" weekly radio programme on Plains FM. In 1993, he was a spokesman for GATT Watchdog, an offshoot of Christchurch's Maoist influenced "Campaign Against Foreign Control of Aotearoa". In 1994/95 Choudhry was spokesman for the Christchurch branch of Information on Ireland, NZ's Irish republican support group. In March 1996, Choudhry gave a paper, "Thoughts on Network Building" to a Sri Lankan gathering of the "Peoples Plan for the 21st Century". PP21, is one of the most significant leftist networks in the Asia-Pacific region. Founded in Japan by in 1989, PP21 linked KGB and Maoist influenced NGOs in Thailand, Nepal, Bangladesh, India, Japan, Malaysia, Indonesia, several Pacific states and New Zealand. PP21's New Zealand affiliate was until around 1998, the People's Network, led by several former members of the Workers Communist League (including Green MP, Sue Bradford and several "Liberation Theology" Catholics. Choudry was Christchurch contact for the People's Network and contributed articles to their newsletter, "Common Ground". In July 1996, Choudhry accompanied the NZ tour of Mexican Anti Free Trade activist Dr A V Calderon. This apparently attracted the interest of the Security Intelligence Service, who were caught by Choudhry's friend, David Small trying to burgle Choudhry's home. After official denials and much toing and froing the NZ government settled out-of-court with Choudry after a high-profile legal case. In 1996, Choudhry also joined the committee of Christchurch's Philippines Support Network-Aotearoa, a cheerleading group for the Communist Party of the Philippines and its revolutionary front groups. The peripatetic Aziz Choudry, who has been a key member of the PSNA committee for six years....In those six years, Aziz has been a central figure in PSNA - he has visited the Philippines several times (most recently in August 2002), building up a most impressive network of contacts in the Philippine progressive movement. He has written regularly for Kapatiran and was our regular layout artist. He did the most recent work on New Zealand's Bukidnon forestry scheme (Mindanao), writing a report on it. He was involved in all our campaigns throughout that period, such as the speaking tours by KMU leaders Crispin Beltran and Emilia Dapulang...and right up until his departure he was actively involved in Philippine issues, such as the campaign to defend Joma Sison from the consequences of being designated as a terrorist. Joma Sison, is of course Jose Maria Sison, leader in-exile of the Maoist/terrorist, Communist Party of the Philippines. At a meeting in Zutphen, Holland in May 2001, Sison founded the International League for People's Struggles. Attended by 339 delegates and guests, representing 232 mass organizations from 40 countries, the ILPS's members were all Maoist leaning and sympathetic to the revolutionary forces in the Philippines, India and Nepal. Choudhry was one of several NZ delegates to the conference, representing GATT Watchdog. In his work with GATT Watchdog and later "Arena", Choudhry has become one of NZ's leading anti free trade activists. He is the author of many papers on APEC, MAI, GATT/WTO and has participated in alternative forums on APEC in Osaka (1995), Manila (1996), Vancouver (1997),and Kuala Lumpur (1998). Since 2001 (apart from some time in Canada) Choudhry has been most active in Christchurch based anti-globalisation group, Arena. Arena is an Aotearoa/New Zealand network of individuals and organizations committed to resist corporate ‘globalization’ in all its forms. Arena stands for an alternative development model based on self-determination, social justice, genuine people-centered development and environmental sustainability. A list of Arena's sponsors reads like a who's who of the anti-globalisation left. Can't for the life of me understand why the Security Intelligence Service, would want to keep an eye on Aziz Choudhry. a dangerous muzzie who should be in jail. all muzzies in nz should have to take a loyalty test and be kicked out if they fail.